The insertion of a peripheral intravenous catheter is often required by patients during a hospital stay. However, approximately 30% of intravenous catheters experience catheter failure. Using ultrasonography to observe the depth and diameter of a vein and to thereby perform catheter site selection is a promising procedure to prevent catheter failure. Nevertheless, it is difficult to perform this procedure, as it is associated with complicated maneuvering in which a nurse simultaneously manipulates an ultrasonographic probe, assesses veins, and inserts a catheter. In this study, a new image displaying system that consists of a camera, head-mounted display, and software is proposed. 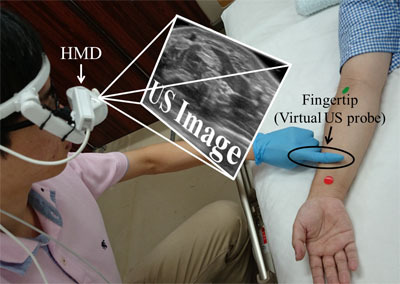 The newly developed image-processing program detects the fingertip of a user, and the system displays the reconstructed ultrasonographic image at any cross-sectional plane as indicated by the user’s finger. Additionally, veins are superimposed on the ultrasonographic image, and the depth and diameter of veins are also displayed on the image. The newly developed image-processing algorithm detects markers and fingertip in the images captured by the head-mounted camera by robustly detecting the fingertip. This aids in realizing a new ultrasonographic image displaying system. This system is used to increase the success rate of vein detection by nurses in a study of volunteers. Full text (2.2MB) (free) Please log in. S. Noyori, G. Nakagami, H. Noguchi, K. Yabunaka, T. Mori, and H. Sanada, “A New Ultrasonographic Image Displaying System to Support Vein Detection,” J. Robot. Mechatron., Vol.29, No.2, pp. 306-316, 2017. W. Zingg and D. Pittet, “Peripheral venous catheters: an under-evaluated problem,” Int. J. Antimicrob. Agents, Vol.34, No.4, pp. S38-42, 2009. C. M. Rickard, J. Webster, M. C. Wallis, N. Marsh, M. R. McGrail, V. French, L. Foster, P. Gallagher, J. R. Gowardman, L. Zhang, A. McClymont, and M. Whitby, “Routine versus clinically indicated replacement of peripheral intravenous catheters: a randomised controlled equivalence trial,” Lancet, Vol.380, No.9847, pp. 1066-1074, 2012. T. Takahashi, R. Murayama, M. Oe, G. Nakagami, H. Tanabe, K. Yabunaka, R. Arai, C. Komiyama, M. Uchida, and H. Sanada, “Thrombus with subcutaneous edema detected by ultrasonography related to peripheral intravenous catheter failure,” Congress brochure of The 4th World Congress on Vascular Access, p. 20, 2016. L. C. Hadaway and D. A. Millam, “On the road to successful I.V. starts,” Nursing (Lond)., Vol.35, No.1, pp. S1-14, 2005. P. Szmuk, J. Steiner, R. B. Pop, A. Farrow-Gillespie, E. J. Mascha, and D. I. Sessler, “The VeinViewer vascular imaging system worsens first-attempt cannulation rate for experienced nurses in infants and children with anticipated difficult intravenous access,” Anesth. Analg., Vol.116, No.5, pp. 1087-1092, 2013. M. J. Kim, J. M. Park, N. Rhee, S. M. Je, S. H. Hong, Y. M. Lee, S. P. Chung, and S. H. Kim, “Efficacy of VeinViewer in pediatric peripheral intravenous access: a randomized controlled trial.,” Eur. J. Pediatr., Vol.171, No.7, pp. 1121-1125, 2012. R. N. Kaddoum, D. L. Anghelescu, M. E. Parish, B. B. Wright, L. Trujillo, J. Wu, Y. Wu, and L. L. Burgoyne, “A randomized controlled trial comparing the AccuVein AV300 device to standard insertion technique for intravenous cannulation of anesthetized children,” Paediatr. Anaesth., Vol.22, No.9, pp. 884-889, 2012. M. D. Witting, S. M. Schenkel, B. J. Lawner, and B. D. Euerle, “Effects of Vein Width and Depth on Ultrasound-Guided Peripheral Intravenous Success Rates,” J. Emerg. Med., Vol.39, No.1, pp. 70-75, 2010. J. M. Fields, A. J. Dean, R. W. Todman, A. K. Au, K. L. Anderson, B. S. Ku, J. M. Pines, and N. L. Panebianco, “The effect of vessel depth, diameter, and location on ultrasound-guided peripheral intravenous catheter longevity,” Am. J. Emerg. Med., Vol.30, No.7, pp. 1134-1140, 2012. H. Tanabe, T. Takahashi, R. Murayama, K. Yabunaka, M. Oe, Y. Matsui, R. Arai, M. Uchida, C. Komiyama, and H. Sanada, “Using Ultrasonography for Vessel Diameter Assessment to Prevent Infiltration,” J. Infus. Nurs., Vol.39, No.2, pp. 105-111, 2016. American Institute of Ultrasound in Medicine, “Use of Ultrasound to Guide Vascular Access Procedures,” AIUM Pract. Guidel., 2012. Y. Kobayashi, R. Hamano, H. Watanabe, T. Koike, J. Hong, K. Toyoda, M. Uemura, S. Ieiri, M. Tomikawa, T. Ohdaira, M. Hashizume, and M. G. Fujie, “Preliminary in vivo evaluation of a needle insertion manipulator for central venous catheterization,” ROBOMECH J., Vol.1, No.18, 2014. N. Kaneko, M. Sato, T. Takeshima, Y. Sehara, and E. Watanabe, “Ultrasound-guided central venous catheterization using an optical see-through head-mounted display: A pilot study,” J. Clin. Ultrasound, Vol.44, No.8, pp. 487-491, 2016. N. Hanafusa, T. Torato, and T. Katano, “Future Blood Vessel Puncture Procedure With Use of Head Mount Display,” Ther. Apher. Dial., Vol.20, No.1, pp. 88-89, 2016. D. Lee and S. Lee, “Vision-Based Finger Action Recognition by Angle Detection and Contour Analysis,” ETRI J., Vol.33, No.3, pp. 415-422, 2011. G. Welch and G. Bishop, “An Introduction to the Kalman Filter,” Course Notes 8 ACM SIGGRAPH 2001, 2001. Y. Aoki, K. Kaneko, T. Sakai, and K. Masuda, “A study of scanning the ultrasound probe on body surface and construction of visual servo system based on echogram,” J. Robot. 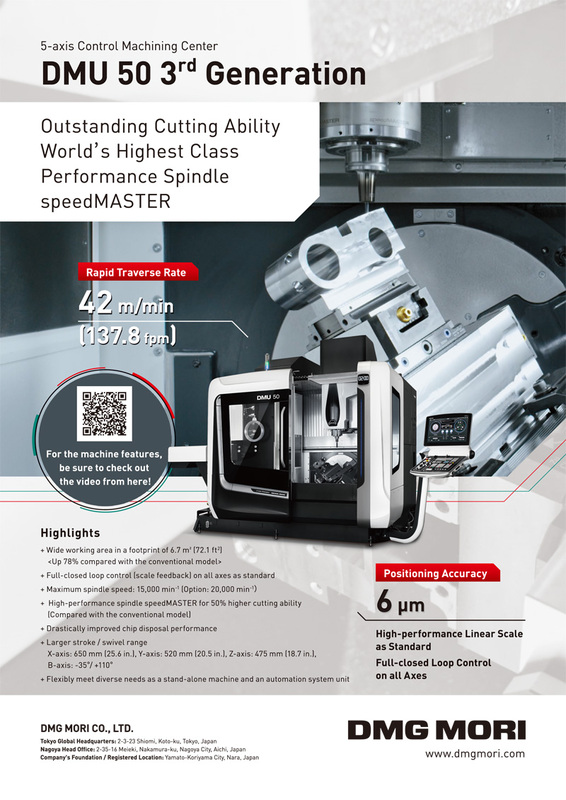 Mechatronics, Vol.22, No.3, pp. 273-279, 2010. K. Ito, S. Sugano, R. Takeuchi, K. Nakamura, and H. Iwata, “Usability and performance of a wearable tele-echography robot for focused assessment of trauma using sonography,” Med. Eng. Phys., Vol.35, No.2, pp. 165-171, 2013. Y. Minami, H. Chung, M. Kudo, S. Kitai, S. Takahashi, T. Inoue, K. Ueshima, and H. Shiozaki, “Radiofrequency ablation of hepatocellular carcinoma: value of virtual CT sonography with magnetic navigation,” AJR. Am. J. Roentgenol., Vol.190, No.6, pp. W335-W341, 2008.